Good Basketball players possess the skills, hustle, and finesse required of the sport. These traits will be useless if you cannot even last for a half hour running back and forth on the basketball court. This endurance is why basketball strength training tips are necessary for people who want to improve their skills on the basketball court. If you are looking for one of the best training institutes then you have come to the right place. Larry Hughes Basketball Academy St Louis, MO offers astounding basketball training sessions. Do you think Larry Hughes would have become a basketball legend if he did not focus and dedicate his time practicing his game? Of course not! Trainers design special kinds of training to help professional athletes achieve their goals, but basketball strength training is not only for power forwards and for big centers. These types of training are also for small basketball players, such as guards. Whether you are a beginner in basketball or just want to hone your skills, registering for Basketball Training St Louis, MO is the best bet. Below are the most important strength-training tips, which Larry Hughes basketball academy St Louis, MO attains, they will help you to improve your skills, strength, and speed in playing basketball. For basketball players gain strength, speed and to experience the maximum increase in their muscle mass, they have to spend three days of explosive training. It is important to involve yourself in this kind of routine because you are giving your muscles enough time to rest and repair for further growth. One of the most common mistakes most players make is that they spend more time in the gym than they need to. Spending extra time shooting balls or practicing your dribbles will give great and positive results, but not when it comes to muscle training. Basketball weight training means a total workout of the whole body, not a split exercise program that only trains specific areas of the body. When you spend your time exercising in the gym, make sure that you do not spend more than an hour there. If your time exceeds an hour, it means you are spending too much time exercising, which in turn will only make your muscles sore and may lead to injury. Basketball players do not need to have a massive physic with bulging muscles. They need to have lean, but firm muscles to help them move quickly. That is, their training is a combination of workouts that equally benefits the whole body. You also have to make sure that you include high-intensity workouts to achieve the results you want. Doing so will give you two great benefits and these are an improvement of endurance and stamina while building a leaner but firm group of muscles and will even increase your jumps and hang time. 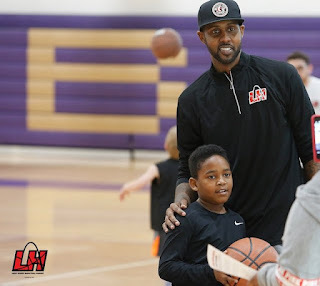 Another thing that Larry Hughes Basketball Academy St Louis, MO wants to remember is to never do any weight training on the day before your game. Working out a day before the game can get you tired easily. When you follow these two simple basketball strength training tips, you are on your way of developing skills, building endurance, and having a great time playing basketball.